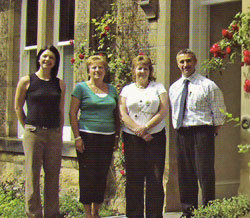 Welcome to the Eskbank Chiropractic Clinic website. We are an established Chiropractic clinic and have operated in Eskbank since April 2000. In October 2015 we opened the Westgrove Chiropractic and Spinal Rehab Centre in Melrose. Please look round our website. It is full of information and advice including simple excercises from the 'Straighten up Scotland' campaign and our most recent 'Backpack Safety' campaign which aims to improve our posture and keep our spines mobile. Please also look for the two clinics on Facebook!